Calendar of PAPNM events such as the annual National Juried Members Exhibition, Paintout and Shows, associated workshops, annual members' meetings and more. For regularly scheduled Paintouts see the members only Schedule of the PAINTOUTS page. Login in to see events visible only to members. Not a member? Select Join Us to become a member and view more events. Select About for information about the organization. Calendar View: 'Switch to Calendar View' to the right if you prefer seeing a calendar at a glance. Note that the date appearing in the calendar view is the start date of the event, which might be the start of a registration period. 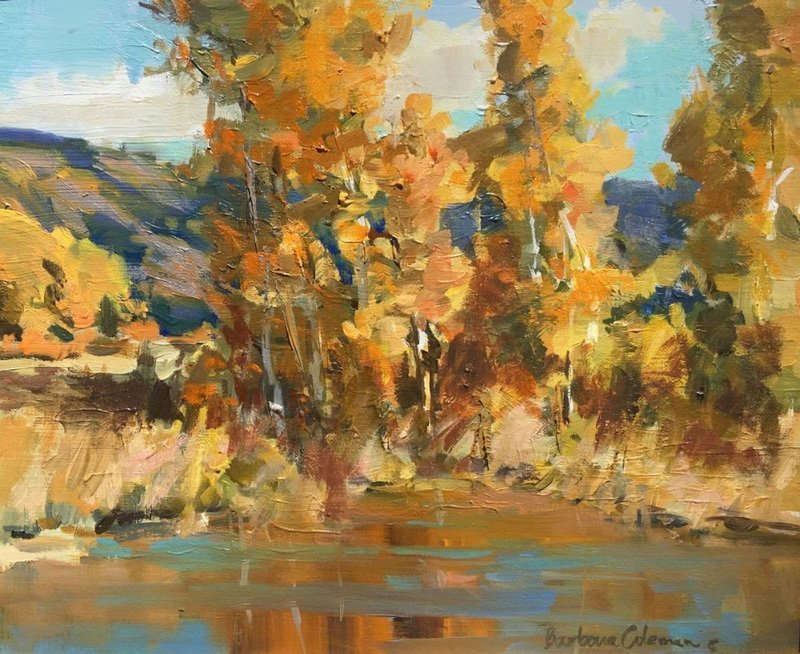 As a bonus, Barbara Coleman, the Judge of Awards for the 2019 Jemez Springs Non-juried Paintout and Show, will be offering a three-day workshop. Join national award winning artist, Barbara Coleman, for a three day workshop in stunning Jemez Springs, NM. 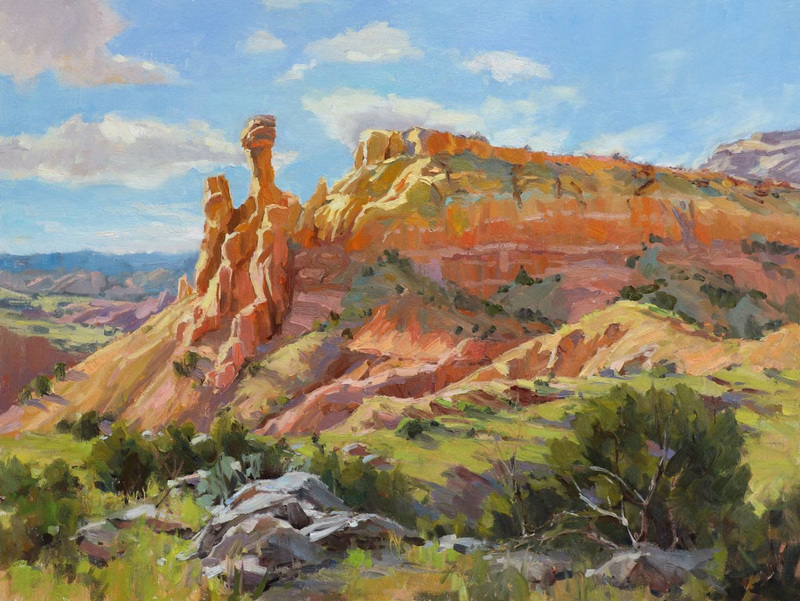 Taking place before the PAPNM 2019 Jemez Springs Paintout & Show, Barbara will cover topics to strengthen your skills in capturing beauty and design from the landscape. This workshop will hone your ability to design compositions, observe color, and create value relationships, which are essential to making compelling paintings. Learning to see the five types of light (identified by the artist John Singer Sargent) to capture form through light and shadow. You will understand which type of light you are painting in, allowing you to see color and value relationships more accurately. "Color gets all the credit and Value does all the work." Learn to see, design and create strong value plans to strengthen your composition. Color gets its due credit! Learn to see values within color, and paint beautiful color according to your value plans. These concepts will be taught through daily lecture and demonstrations. Students will be given a series of exercises to see and practice these ideas. We will meet at Jemez Fine Art Gallery, 17346 Hwy. 4, Jemez Springs, NM each morning to begin our adventures..
For ongoing updates see: the Workshop with Barbara Coleman page. It also now includes a photo album for your photos to be uploaded before or during the workshop. Paintout & Show Sign-up is closed. Lunch Sign-up Deadline: April 18. You will be able to sign up for the free Apr 27 lunch with the code you receive in the registration confirmation email AND in the reminder email of April 12. Sign up for the lunch here: Sign Up - Jemez Springs Paintout & Show Saturday Lunch. (new) select Evite to use and print. Also visit the sponsor page for this event: here. Designated Paintout Area: Within an approx. 35-mile radius of Jemez Springs, New Mexico in permitted areas. See map. Awards:To be decided by judge. Cash awards will be $300 for First Place, $200 for 2nd place, $100 for 3rdplace. Additional awards will include merchandise, cash awards, and gift certificates from PAPNM sponsors. General Requirements: Open to the first 60 PAPNM members who register and pay entry fee. Each artist will be allowed to enter one painting into the show (maximum size 14 x 18). All painting surfaces must be stamped on the back during the event to be eligible for entry in the show. Check-in, packet/name tag issuance and stamping will be at times and locations to be announced. All work must be at least 80% completed en plein air, within the allotted paintout period and within the specified paintout locations. All work exhibited must be for sale. If an artist’s painting sells and the buyer takes it, that artist may replace the sold painting with another stamped painting done during the paintout. Paintings are not stored on the gallery premises. Artists receive 75% of the sale price less 6% if it is purchased by credit card. Artists are responsible for paying the gross receipt tax due from any sale and could consider factoring the tax into their sale price. Framing Requirements:All work must be sturdily framed and ready to hang, with d-rings and wire. No metal frames or saw tooth hangers will be accepted. Artist name, title, price to appear on supplied label and affixed to the back of painting. Entry Fee:$39 (non-refundable) Entry fee includes gallery space and a participant lunch on Saturday, April 2. The Register button is to the left on the website when available. Agreement of Entry and Liability: All reasonable care will be taken with paintings. However, neither Jemez Fine Art Gallery nor PAPNM, their agents, employees, volunteers or anyone working on the exhibition will be held responsible for any loss or damage to artwork left in the gallery. Insurance is the responsibility of the artist. PAPNM is not liable for personal injuries or theft sustained at paintout locations of this event. PAPNM reserves the right to reproduce accepted artwork for publicity purposes. PAPNM reserves the right to reject work deemed unsuitable for public viewing. All payments are final and non-refundable. Purchaser of artwork from the gallery shall arrange for all aspects of shipping if needed. Your entry and payment constitute acceptance of all conditions and terms of this prospectus. Those wanting to enter the Clovis Community College Exhibition may leave a second framed painting at the above times. Separate paperwork is required to be filled out for the CCC Exhibit, plus a $5 fee. Retrieval:All unsold paintings to be picked up 11 a.m. – 4 p.m. on Thursday May 23. All unclaimed paintings will become the property of PAPNM and will be disposed of as the board sees fit. See the main website page for this event, 2019 Jemez Springs Non-juried Paintout and Show, for more details such as lodging discounts (and for any updates as we approach the event dates) plus a participating artist directory. Sign Up through May 31 with a maximum of 75 artists. No fee is due when registering online. However $5. is to be paid at time of delivery of the painting (to cover shipping and handling). Prospectus: (General Requirements, Delivery, Retrieval, and Lodging). Would you like to participate in this year's Signs of Spring Online Contest? Visit the 2019 Signs of Spring Contest page for the general contest description including the benefits of participation. The prospectus provides full details and requirements. Paintings can be any Spring scene painted from any location. A 1-week Favorite Painting voting period will follow with all PAPNM members encouraged to vote. To display your work in this contest you must be an artist member, signature artist member or master signature member of PAPNM. Sign up for membership at Join Us and you will be able to participate in this and many other PAPNM events. 04 Nov 2018 Workshop with Ray Roberts, Judge of Awards - THE NEXT LEVEL OF LANDSCAPE PAINTING. 17 Sep 2011 2011 Members' Juried Exhibition "Land and Light"